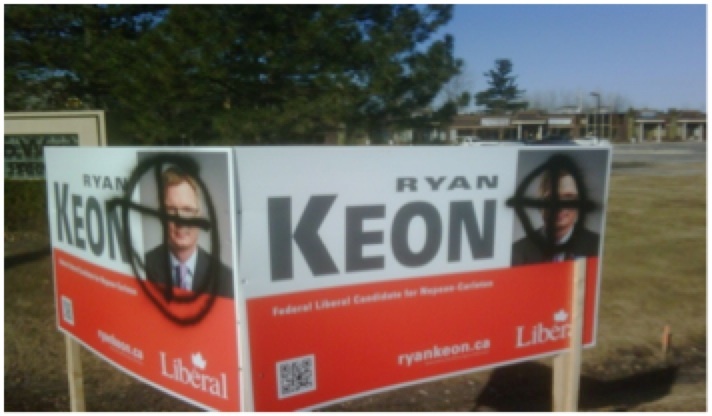 The campaign of Liberal candidate Ryan Keon says several of his campaign signs around the Nepean – Carleton riding were vandalized overnight, with ominous cross-hairs spray-painted over his face. More than 100 signs were damaged in Greely, Kars, Manotick, Metcalfe, and Osgoode, all communities south of Ottawa, the campaign said, at a cost of about $2,000. Keon is running as a long-shot to unseat Conservative incumbent Pierre Poilievre. Keon’s public signs were tagged overnight with black spray paint in which a shooting target was spray painted over the head shot on his signs. The signs were also tagged with graphic and explicit messages on the signs. “This really is a direct attack on our democracy. This election is about presenting myself as a viable alternative to the current Member of Parliament. I have two young children at home, and I now have to explain to them why their father’s picture on my campaign signs has a bulls-eye on my head. It’s incredibly disturbing to me, my family and to our democracy,” concluded Keon. While Keon isn’t pointing the finger at any of the other candidates, his campaign has referred the matter to the Ottawa Police Service. This is truly appalling. This story needs to go across the country. I really hope you remain involved in the campaign. I am sorry this has happened to you. The persons responsible for this live in the rural areas of the riding. They are no no doubt unemployed and CARRY A GUN! Mr Harper, what say you? Whether or not a gun owner did this, it is really rude to jump to the conclusion that a gun owner did. How would you like it Marilyn if somebody blamed women for something like this? Did they, probably not. But pointing fingers at people we already hate and jumping to conclusions about them won’t help us at all. For people not voting Conservative, polls will give the impression that there is no hope. Staying at home only exacerbates the problem. Signs being vandalized is nothing new. I volunteered in various campaigns since 1968 and have had to replace almost as many signs as were originally posted. This happens to all parties so I wouldn’t get to upset about it. That riding has to be one desperate riding to have Pierre as their candidate? Good grief are any of you actually Canadians? 200 signs across 2 ridings targeted. My first thought on seeing the photo was not the cross-hairs but the Celtic cross that has been hijacked by the neo-nazis. Either one is not very pleasant. Not another Liberal with damaged signs. When ever they are the underdogs the Liberals attempt to manufacture a sympathy vote for themselves. Remember Liberal Carolyn Bennett? Democracy and Ethics? Look in your own back yard. Pathetic.